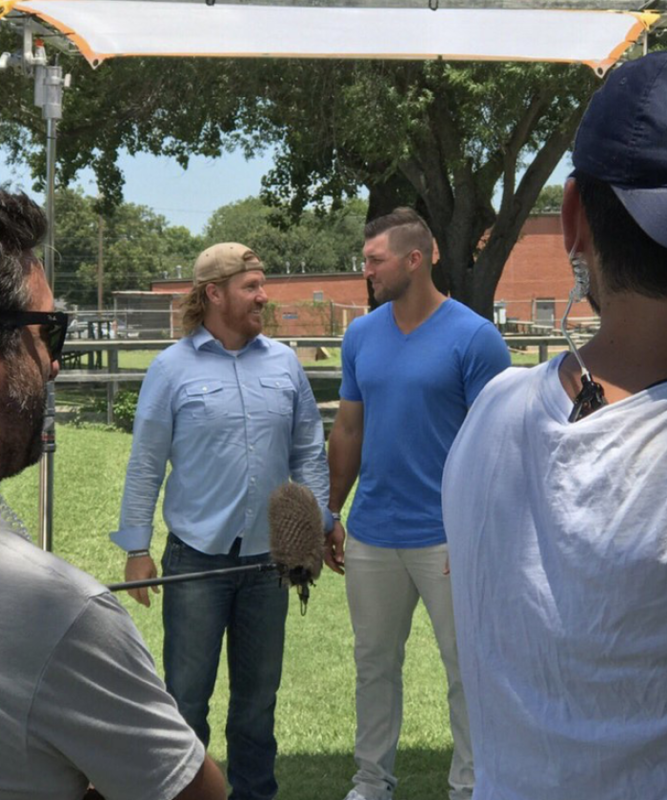 Former NFL quarterback-turned-Minor League Baseball player Tim Tebow teamed up with popular Christian couple Chip and Joanna Gaines for their HGTV home renovation show "Fixer Upper" in a collaboration that Chip said changed his life. The comedic handyman took to Twitter on Tuesday to promote the episode featuring Tebow. "I loved working with my body double @TimTebow — looking at him is like looking in a mirror," Chip tweeted. "Watch #fixerupper at 9/8 CT on @hgtv. Stick with us until the end for an opportunity to partner w/ the Copp family. Their story changed my life and I've got a feeling it might change yours too." Chip and Joanna teamed up with Tebow and the Tim Tebow Foundation to help make a wheelchair-accessible house for the Copp Family. The Copp family lives in Waco, Texas, and have two sons who are wheelchair bound. The children, Calen and Lawson, are battling a life-threatening condition that affects their ability to stand and walk on their own. So the Tim Tebow Foundation helped the family of four move from an apartment into a home of their own which was designed by the Gaines. Throughout the episode, Chip joked around with the athlete about their similarities. Tebow was also on hand at the end of the program to present the house with the Gaines. Not only did Tebow's foundation help the Copp family, but the Make A Wish Foundation chipped in to build the boys a fun playground behind the house. The family's new hope features pull up bars to help Calen and Lawson get around while inside the home, and the Gaines built ramps outside to help the boys have easy access to the front door. The bathroom was also completely remodeled for accessibility and inspiration. The quote "I can, I will" was placed on the wall to help remind the boys that they can do anything. The Copp house is among one of the last homes Chip and Joanna Gaines will be remodeling for "Fixer Upper." The couple shocked the world in September when they announced they were canceling "Fixer Upper" after five successful seasons. Chip said on NBC's "Today" show that they wanted to take a "step back and take a break" to focus on their family. "For us, the most important thing in the world is our relationship, followed by the well-being of these four kids, and we didn't want to push and red line it so far that one day we woke up and realized, we're at the point of no return," Chip explained. "So we wanted to take a step back and focus on the thing that is the most important in the world, which is Jo and our relationship." "We are as healthy as we've ever been, but I just didn't want to continue pushing this envelope to the fullest extent. We are very thankful that we had the opportunity to step back and take a break." The Gaines revealed at the top of the year that they are expecting baby No. 5.